In Homer’s Odyssey there is an island called Ogygia, the home of the demi God, Calypso, where she keeps the main character Odysseus from returning home. There’s been a lot of speculation about where exactly this island is in the world we know, and the best guess has been Gozo. So let’s have a look at that. Calypso was a nymph who runs through Greek mythology, not a demi-god, but that’s grand enough to get you interested. She did quite a few things throughout ancient-Greek lore, but her most famed role is in the story of Odysseus, when she stole him and kept him on an island for seven years in an ultimately-vein attempt to make the handsome chap her immortal husband. If we going on current marital states, I’d say that seven years was a good stint, but this was a few thousand years ago, and I think things lasted a little longer, back then. This is where we try and combine the two things. You’d assume that Calypso and Odysseus ate something other than grapes for those seven years, so is there any clues in current Gozo cuisine that we can attach to them? There’s a traditional Maltese dish called Aljotta that would work quite well here. 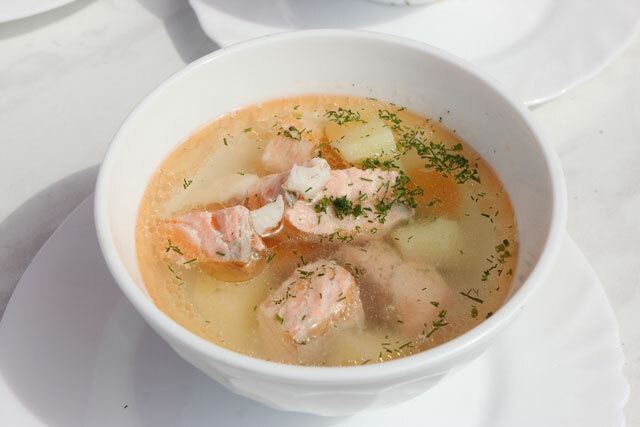 It’s a fish soup that is often eaten around lent, and fits into the highly-economical way of life in the Maltese islands, born from their history of financial and military hardship – by that, I mean you use the whole fish. Head and tail and everything except the guts. This dish will definitely serve four, and you may have a few portions left over if you’re tiny people that don’t eat much. 800g Fish – preferably rock fish, but snapper, halibut or flounder will do. The creation of the soup is, like most soups, pretty easy. Fry the garlic and onion for five minutes until they’re soft. Take the fish out of the soup and remove the skin, heads, tails and bones. Strain the liquid, putting it back onto the heat for the rice. Once the rice is cooked, add the fish back in, give it a squeeze of lemon. Then serve with the other lemon, sliced, bread, and some fresh parsley if you have it lying around. If you came here for the food but want to know more about the Odyssey, or perhaps you’ve read the original novel but want more, here are some other great books based on the tale. This is probably the most famed link to Odyssey. James Joyce slipped several parallels in the modernist novel between Odysseus and the protagonist, Leopold Bloom. Good news is that this book is public domain, so you can grab it for free pretty much anywhere. This film, while seemingly unrelated, is a modern satirical film based on the odyssey. Let me know if you’ve watched it and can see the similiarities. I can’t. Thanks for the comment Jensen! The most extravagant novel-based meal I've done is Tyrion's meal in Winterfell somewhere in A Game of Thrones. It was a whole fish, two eggs, some old bread and some very, very burnt bacon, washed down with some Old Peculiar. A fascinating and in depth article. I've just started cooking for myself (I'm a English Literature student and awful at the cooking but getting on okay at the literature). Inspired by this article though, I might try to make my way through some of my favourite literature dishes... Cocoa-Cinnamon Babka (The Amazing Adventures of Kavalier & Clay, Michael Chabon) Zaytoons’s Chicken Shwarma (Motherless Brooklyn, Jonathan Lethem Dorothy’s Famous Christmas Toffee (Freedom, Jonathan Franzen) I'm sure there are some great ones from classic literature, but I can only ever remember the ingredients they describe, rather than the dishes. Big Joyce fan over here!